This awesome skateboard is the ideal entry-level skateboard for those just starting out. 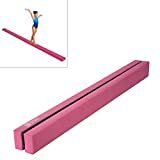 With an 8 inch (20 cm) wide base, the deck is constructed of 7-ply maple wood, and covered in black grip tape on top, offering plenty of stability, and measures 31 inches (79 cm) long. 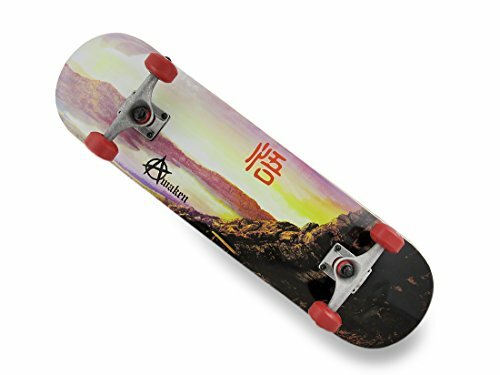 The bottom features a cool mountain lake sunset scene, and durable 5 inch (13 cm) heavy duty aluminum rock stone finish trucks with ABEC 5 bearings and 52mm solid red wheels with the `Awaken` logo. With this skateboard, you`ll be carving your own path in no time! 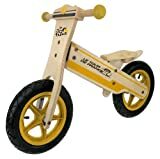 A brilliant gift for the beginner, or to propel yourself around the park, the neighborhood or to catch some air on the quarter pipe in the driveway (just don`t forget your helmet)!